Image studies help demonstrate the perceived value of your brand and can be used to develop its value and improve customer loyalty. 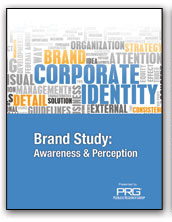 PRG provides research solutions to help gain a better understanding of the value and significance of your brand name vis-à-vis the competition, ascertain brand loyalty and examine how customers and prospects view your company. These studies can further be used to pinpoint what your company offers that others don’t as well as uncover areas in which your brand is different or unique from competitors’.